Sinusitis is a painful condition caused by swelling and inflammation of the sinus cavities that can make daily life unbearable. Acute sinusitis is frequently caused by an infection (bacteria) and will respond to antibiotics. Chronic sinusitis, on the other hand, is defined as sinusitis that lasts for more than 12 weeks and is usually caused by something other than an infection. 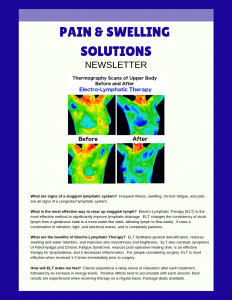 Pain & Swelling Solutions specializes in reducing the pain and inflammation caused by chronic sinusitis and offers numerous techniques to promote natural sinus drainage, helping you to avoid painful and expensive surgery. Congestion of the sinuses accompanied by pain in and around the areas of the eyes, nose, cheeks, and forehead. Steroids are typically given to sufferers of chronic sinusitis to reduce inflammation which often lessens the pain due to diminished pressure. Irrigation of the sinuses can help to flush out the buildup of mucous that contributes to sinus pressure and pain. Surgery is required for some people with chronic sinusitis because of nasal polyps or narrow passages that do not allow for easy mucosal drainage. Electro-Lymphatic Therapy (ELT) is a powerful way to combat chronic sinusitis because it painlessly dissociates (breaks up) protein molecules in lymph deep in the sinus cavities that are inhibiting drainage. This allows the lymph to flow and provides relief from painful pressure buildup. CranioSacral Therapy can also be used to help relieve chronic sinusitis. Gentle manual techniques alleviate restrictions and open up the sinus cavities allowing fluid to drain normally.